The weather and the fishing has been good. Water temperatures in the 80's.. This makes me and the fish very happy. It is tarpon time now. The tarpon are here! 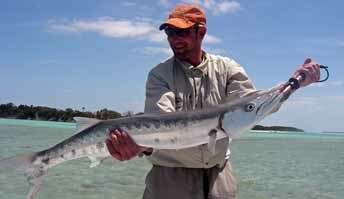 Tarpon are in the back country basins, channels and channel edges.. We are on the beginning of the migration.. They should be moving on the oceanside soon too. Still finding some permit on the flats.. Soon most of them will leave for thier off shore spawning activities... Been finding some bonefish on the flats in some of the same spots we look for permit..
Barracudas are still on the flats and have been a lot of fun.. These fish are fast, strong and can make some great jumps..